While slip dresses are often filed under the ’90s revival category, these slinky lingerie-inspired numbers have actually endured throughout much of contemporary fashion history. Sure, Kate Moss, Naomi Campbell and Courtney Love cemented the piece’s status as a late ’90s hallmark trend, but the oh-so iconic slip dress still tends to resurface on runways and in street style spheres every few years or so. It should come as no surprise, then, that the slip dress has made yet another return to the mainstream, with stylish ambassadors like Bella Hadid, Rihanna and Emily Ratajkowski sporting the trend—and infusing it with modern flair. 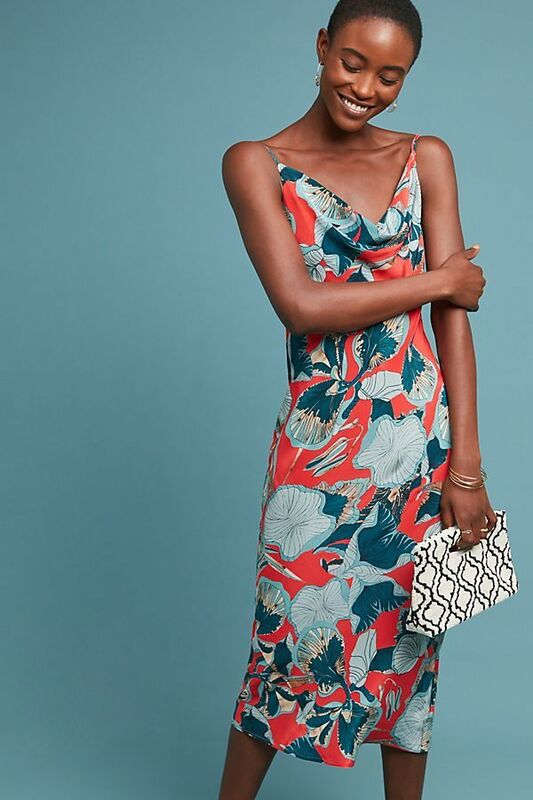 While silky, monochromatic slips with barely-there spaghetti straps were the gold standard design in the ’90s, we’re now seeing playful patterns—everything from vintage-inspired florals to oh-so contemporary animal prints—emblazoned all over the formerly minimalist frock. Shorter hemlines, ruffle accents and ultra-flattering cowl necklines are also helping to bring the slip dress into 2019, leaving the piece feeling more wearable than ever. One of the most alluring aspects of the slip dress is (and has long been) its simplicity. But now that slip dresses have been remixed for the contemporary fashion landscape, they’re available in a range of shapes, sizes and aesthetics. Slip dresses would just as at-home at a rock concert (paired with sneakers and a vintage denim jacket) as they would at a cocktail party (combined with strappy heels and drop earrings). And expanded size inclusivity has made them more accessible, too. Whether you’re interested in a curve-skimming fit or a boxy, shapeless cut, you’re sure to find it—and the increasingly diverse necklines have paved the way for full-busted and small-chested women, alike, to take advantage of the trend. This floral-print frock basically epitomizes Reformation’s unparalleled mastery of reinventing timeless vintage styles with modern details. 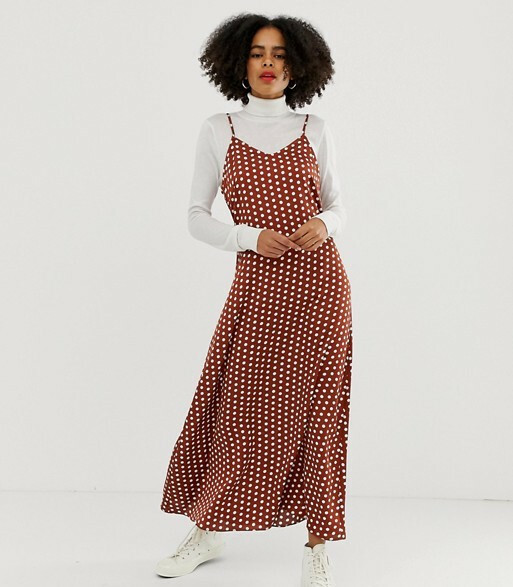 This polka dot maxi + turtleneck + sneakers combo is the answer to adding some tomboy to your slip look for daytime. Gorgeous draped detail and a curve-hugging wrap cut make this hot pink frock universally flattering. Evidence that slip dresses can look modest without looking shapeless. With a slim cut but relaxed fit, this stunning maxi slip skims the curves in all the right places. This playful ’90s-inspired frock totally belongs in Cher Horrowitz’s computerized closet. A classic slip dress with this season’s favorite accent detail: feathers. Anine Bing is never one to shy a way from topping off virtually any outfit combo with a tailored blazer. Apparently, her signature styling hack even works with a slip. Subtle velvet detailing with a mini cut make this slip even more reminiscent of the ’90s. Silky leopard print midi skirts were practically flowing out of our IG feeds this past winter, but this tiger printed slip is an advanced option if you’re still looking to dabble in the animal print genre. Proof that slinky silhouettes can hug your curves without being too clingy. Modern updates like of-the-moment ruched drapery and lace inlet detailing make this golden hued number feel both timeless and contemporary. 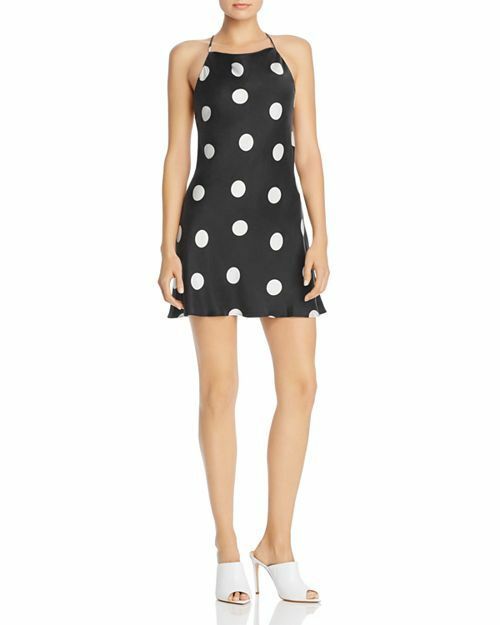 The perfect slip dress to add to your resort wear collection. Feminine frills give the minimalist slip prototype a girly—not juvenile—makeover. This going-out dress will look just as cool paired with a tee underneath as it does with heels on a night out.